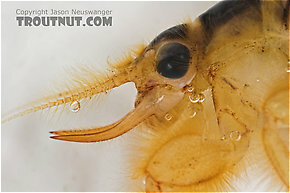 These are sometimes called Giant Michigan Mayflies. It starts like a rise of small trout. There are dimples on the surface--fingerling trout eating midges, perhaps. But these are no fish. The water breaks and out pop the yellow sails of a giant Hexagenia dun. Then another. And another. A vortex appears in a flash below the mayfly and it vanishes with a slurp so loud it echoes off the distant bank. A square tail like a shark fin breaks the surface behind the swirl as a brown trout twice the size of your net retreats back to his deeper lair. The Hex hatch is on. 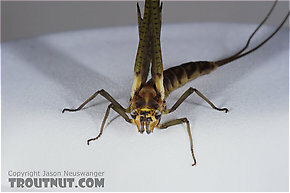 This Midwestern legend plays out every year on calm, dark, humid nights in early July. Anglers who only fly fish once a year drive hundreds of miles to play their part in the drama, while the mayflies themselves make the television news by showing up on doppler radar or calling snowplows out of dormancy to remove layers of Hexagenia (or "Hex") duns from the bridges. In the cold trout rivers of Wisconsin and Michigan, huge nocturnal brown trout whose usual menu consists of smaller brown trout become, for a week or so, prime dry fly quarry. 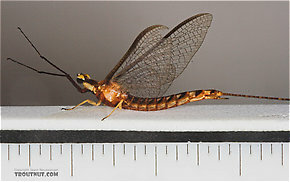 According to the literature, these are the second largest mayflies in the United States, behind the related Litobrancha recurvata flies. However, there are credible reports of limbata exceeding 40mm in some locales that challenge this assumption.